Handmade Bags in Natural Fabrics shows you 60 variations on over 25 basic styles for tote bags, shopping bags, satchels and pouches (both large and small). All of them are easy enough - and designed for fabric lightweight enough - to sew by hand. 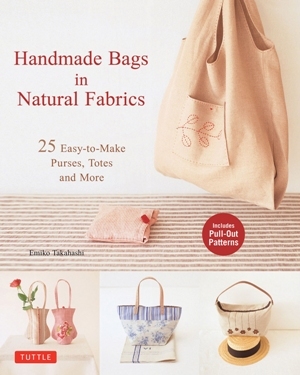 This book provides easy instructions and diagrams, as well as a sheet of full-sized pattern pieces, with a few easy lessons added in to show you the basics of hand stitching drawstring cases, corners, edges, straps and simple embellishments. Paperback 80 pages with pattern sheet.